You’ve been at your position for years and now you are moving on, perhaps to another job within the company or to another company entirely. This is a good time to start making a checklist as you transition out of your position and hopefully help someone new come on board. Write your job description with bullet points of each task you perform (many will have several levels as you start with high level items and get more specific). Your list is likely much more comprehensive than anything found in the HR department. Depending on your specific position, you’ll want to add to this list. You love the company you currently work for. You love your clients and coworkers. You want to see everyone succeed. The main goal is to make sure that the projects you are working on are transitioned so seamlessly, your clients won’t even know you’re gone! When you don’t know who the person is that is presenting, you don’t know what to expect. We definitely didn’t expect David Oakley, at 6pm on a Thursday night in Tampa, to be an incredibly charismatic creative person who told some of the best advertising stories we’ve heard. He was simply hilarious. And to top it all off, he gave everyone a copy of his book, Why Is Your Name Upside Down, which we just finished after losing it in the shuffle and recently rediscovering. This turns out to be a good thing, because it reminded us all over again just how funny David Oakley is and how much we aspire to his lighthearted irreverence, passion for serving his clients, and ability to turn just about any project or proposal into a joyride for all involved. The book recaps in short story form some of David Oakley’s best stories of his work with his own agency, the well-known and respected Boone/Oakley in Charlotte, NC. Seldom does one person possess the ability to both WRITE a great story and TELL a great story, but Oakley shines in both formats. He writes the way he speaks, which somehow works in his case. The stories are easy to read and you can put the book down for a couple weeks and not worry about forgetting where you were. Just pick up at the next story and you’ll remember why you loved this book in the first place. 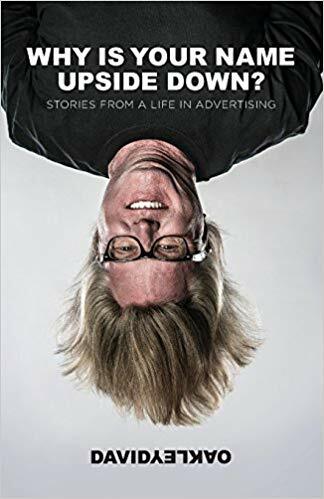 If you’re an agency pro or work in advertising and marketing at all, you’ll appreciate the anecdotal accounts of the mishaps and successes of his agencies. Even if you’re not in the industry, you’ll get a kick out of his wild ideas and execution, his ability to create buzz out of blunders, and his seemingly tireless sense of positivity.